Between Fact and Fiction: BACK OFF, I'M A NINJA Cover Reveal! 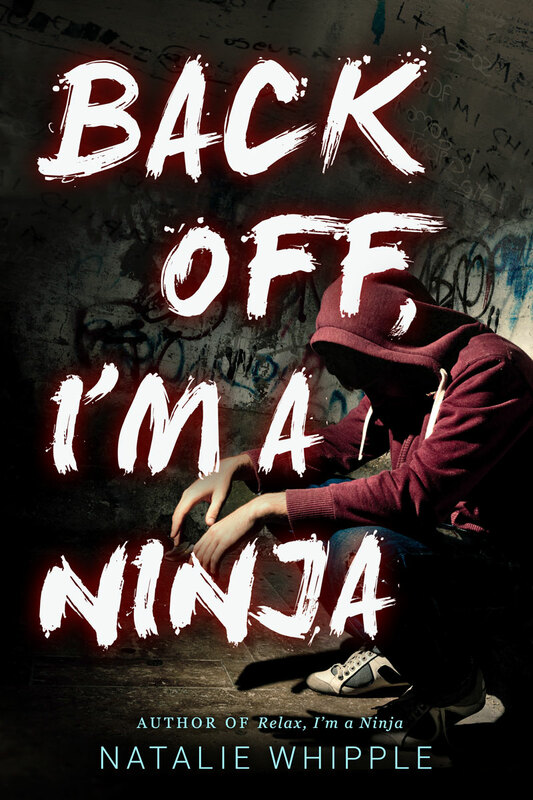 BACK OFF, I'M A NINJA Cover Reveal! Today is the day! I hope you are all as excited as I am to finally see the end of the I'm A Ninja series. It has been with me since 2008 and I'm more than ready to finally finish the series and have a trilogy to my name. It's been a long time coming, and a difficult process. I learned all the hardest lessons in publishing with Tosh and my ninjas, and it is personally rewarding to have gone forward with this series regardless of all the struggles. So let's get on with this cover reveal!!! Wheeee! I found this image in 2013, and I knew immediately that it would be the perfect cover for the last book. Tosh goes through some seriously rough times, and though he's fighting it feels impossible to make it through. I felt like this guy, with the red hoodie and sense of despair, really captured the dire situation of the third book. AND DON'T THEY LOOK SO GREAT AS A SERIES? Now, on to the copy. *WARNING* If you haven't read the first two books, this copy may contain some spoilers like information. Read at your own risk. Tosh and Amy may have managed to keep the demon Akuma in the kami realm, but that hardly spells success. While the living realm is spared, Akuma consumes all kami in his path. Even worse—he’s targeting Tosh and Amy’s ancestors, consuming them and weakening the Inyo all in one shot. When Akuma’s Clan murders not just ancestors but their living relatives, Tosh and Amy can’t waste time mourning those they’ve lost. They must get stronger. They must defeat Akuma before he siphons all their power and more people die. Just as they approach their peak strength, Akuma’s dark shaman deals a devastating blow. Weakened and captured by the enemy, Tosh and Amy have run out of options. Unless they can discover a new kind of strength, they must not only sever their connection with each other but lose their souls, and every else’s, to Akuma. 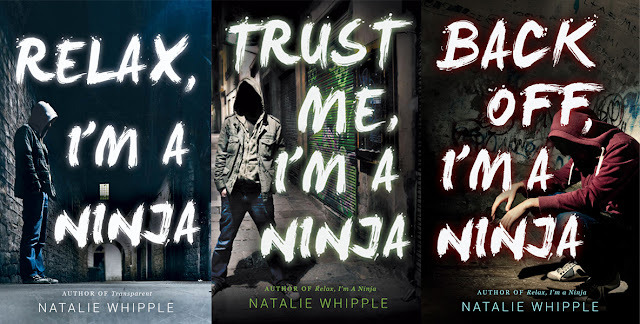 BACK OFF, I'M A NINJA will be out August 30, 2016, but you can win it NOW along with the whole series by entering this giveaway! The first two novels will be sent to you as soon as I have a winner, while BACK OFF will come when I get my first batch of copies. The giveaway is open to the US, Canada, and the British Commonwealth. So get entering! Natalie what a perfect cover! I feel like it really translates how I have seen the progression of Tosh. He has gone through "Wow, this is a real thing I am doing" to "Heck yeah I am doing this" to "How did we get here, and how am I gonna handle all this?" I'm so excited for this 3rd book!!! Looks awesome. Keep it up. I love the new cover and how the whole series comes together! BACK OFF's cover is perfect! I love how all three look together as a trilogy! I love this series!! The three together look brilliant! Love love love the colors! These covers are the best. I would love to win the books! Love love LOVE the cover! And I can't wait to read the last book in this series. I've loved them so far. I'm really happy you pushed through! I hope finishing the ninja trilogy is a great opening to the new place you've found. A great cover & fits the series very well. The covers are amazing and I can't wait to see what happens next! I like the last cover best! Congratulations, Natalie! I haven't read this series yet, but I've enjoyed your other books, especially HOUSE OF IVY AND SORROW. I know how much you love this series, so I'm sure they're awesome, too.